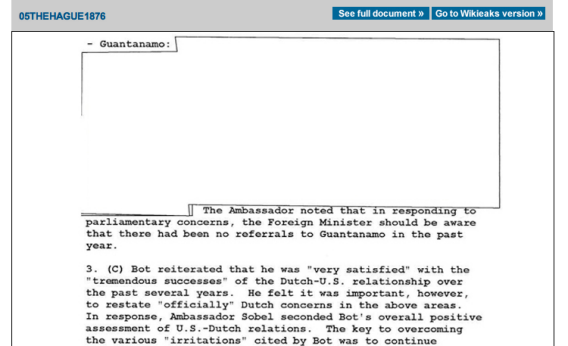 This State Department version of a cable released by WikiLeaks in 2010 redacts portions that deal with Guantanamo detainees, even though that information has long been public. The irony is that the ACLU already has all the information contained in the cables. In fact, a tool on its website lets you view the full cables side-by-side with the State Department’s redacted versions. The organization was requesting the cables only to force the government to acknowledge their content—something the Obama Administration is loath to do. The government’s logic, and the judge’s, is—and I do not think I am exaggerating or distorting their arguments here—that just because something is public doesn’t mean it isn’t also secret. In this case, the cables are secret because they contain information that could be harmful if released. Never mind that they’ve already been released by WikiLeaks. They still could be harmful if released by the government. The ruling seems to uphold a broader U.S. government philosophy that even when everyone knows the government is doing something—conducting drone strikes in Yemen, waterboarding prisoners in Guantanamo—the government can continue to pretend that it is not doing it, and the courts will back it up.